The Zimmer Patient Specific Instruments Planner is the next generation in surgical planning. Using the patients MRI scan, which is converted into a 3D model of the patients lower limb, the Instrument planner allows the surgeon to view the patient’s anatomy in its purest geometrical form. From this information the surgeon is able to develop a customised plan for each patient. 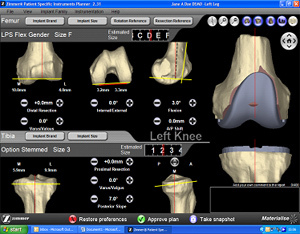 At the click of the mouse, the planning software gives the surgeon the opportunity to make instant decisions about implant selection, implant size, resection depth, femoral rotation, varus/valgus, flexion/extension, and posterior slope. They can then see in real time how these decisions affect the pre-operative plan. Implant options offered by the Instrument Planner includes the full range of NexGen primary knees, which continues to be the best performing knee according to both the latest Swedish and Australian National Joint Registers.